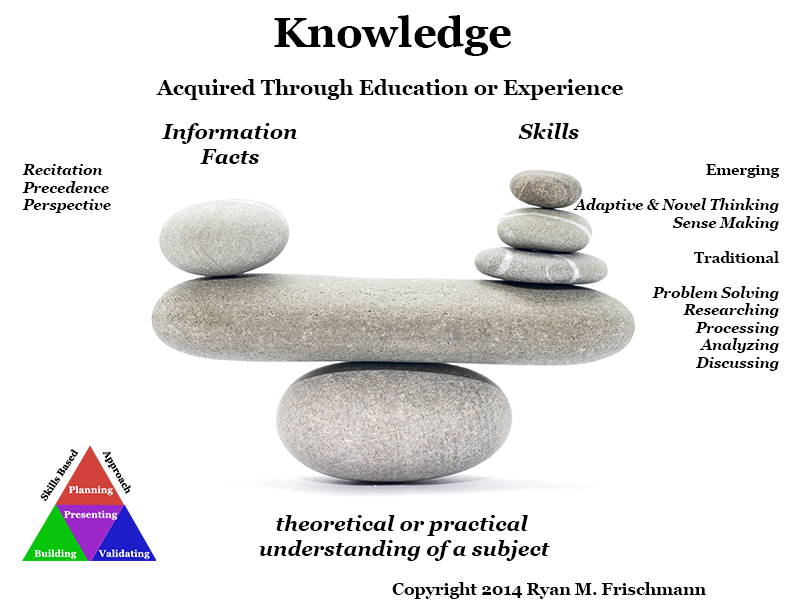 Google’s definition of knowledge: facts, information, and skills acquired by a person through experience or education; the theoretical or practical understanding of a subject. Let’s discuss each clause separately. The underlying notion of knowledge is going through a transformation. Memorization of ‘facts and information’ is less important, and building skills is more important. All possible content is available to us through the internet, social media, and other networks instantaneously on computer and mobile devices. In the not so distant future, implanted devices will interact with our normal thought processes and create an ‘augmented reality’. (Love this video on what this might seem like; be forewarned it is frightening, but realistic .) Why is there rote-memorization in education? Should the focus be on building skills to find, synthesize, and discuss ‘facts and information’? Look at the success of IBM’s Watson – a supercomputer that won Jeopardy and beat the top chess player in the world. Winning Jeopardy requires recalling facts and information in a wide array of subjects and winning chess requires cycling through a significant number of iterations for each move. In a chess match, a supercomputer beats the best human player, but a team of a supercomputer and a human player beats a supercomputer by itself (at least for now). [ii] Of course, humans build the computer and program the underlying algorithms. Players now learn chess in new ways. They optimize the computer for crunching out calculations, know how to process the data, and spend more time reading their opponent. IBM has just come out with mainstream application that utilizes Watson to bring ‘big data’ analysis to the average user. [iii] Learning to ask the right questions is paramount. Memorizing a foundation of ‘facts and information’ is a requirement in certain professions, such as historians, doctors, and lawyers; a common thread in their responsibilities includes being able to recite facts and stats, classify elements, or identify precedence on the spot. Although there are huge online content reservoirs, such as Web-MD and Lexus Nexus, which can be accessed when needed. Nevertheless, a ‘theoretical or practical understanding’ remains critical in these high stakes professions. Knowing ‘facts and information’ is required for developing a perspective. You cannot make an effective argument without a sufficient understanding of the prevailing schools of thought. Still, immediate access to huge reservoirs of facts and information online accelerates this process significantly. The notion of spending days in a library rummaging through printed copies of journals, periodicals, and books is over (still remember the awful, time-consuming process). Now you can follow new ideas in social media, conduct Google searches, and access websites of information distributors. Digital content is much easier to manage – make comments, highlight quotes, and copy and transfer to other platforms. Promote self-guided learning. Learning has become a lifelong commitment because of the rapid adoption of new technologies and dissemination of huge amounts of content. Professionals must keep their skills sharp with new applications. They must also follow the latest trends by following influencers in social media, taking courses, and reading articles, books, and blogs. Focus on skills required to manage, process, and analyze information and facts, as opposed to memorization. Computers are better at memorization and number crunching; humans are better at making decisions and showing compassion and empathy (soft skills). Competency based learning instead of the traditional credit hour model. With online learning, you can learn at your own pace and utilize many different resources. Use the latest technology in all levels of education. It is essential to put the latest hardware and software applications into the hands of students – a generation that is expected to use it. [i] Tyler Cowen. Average is Over: Powering America Beyond the Age of the Great Stagnation. (Penguin, New York 2013). Author TheProfessionalWebsitePosted on September 27, 2014 September 28, 2014 Categories Career Development, Skills Based ApproachTags career development, education, knowledge, learning, skills3 Comments on What Is Knowledge?